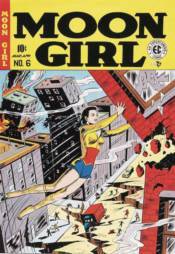 Moon Girl #6 is an exact replica of this scarce 1949 EC issue. It is 36 pages of fully restored artwork by Shelly Moldoff. This is the thirteenth issue of CSP's Flackback Replica series. 'It would be easy to expect this heroine to be a rip-off of Wonder Woman, but instead she's so much more: smart, forthright and confident.' - Comics Bulletin.